ICAS and partner bodies propose new ways to fund growing businesses. The establishment of co-investment funding between pension funds and the private sector on a similar model to the UK Government's Enterprise Capital Funds. Such a model would help promote the establishment of such small venture funds or provide them with access to capital. 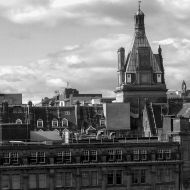 Developing a Super Co-Fund, built on the model of the Scottish Co-Investment Fund, inviting institutional investors to match the combined angel plus public sector co-investment on an agreed ratio. Revisiting the use of Venture Capital Trust structures operating from a base in Scotland.